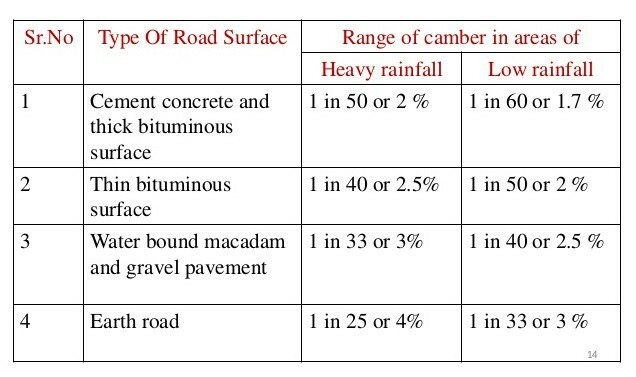 Camber is the slope provided to the road surface in the transverse direction to drain off the rainwater from the road surface. It is also known as cross slope of road. Why Camber Is Provided In Road? 1. To protect the road by preventing the entry of surface water into the subgrade soil through pavement. 2. To prevent the entry of water into the bituminous pavement layers. 3. To remove the rainwater from the pavement surface as quickly as possible and to allow the pavement to get dry soon after the rain. It consists of two straight slopes from the edges with a parabolic or circular crown in the center of camber. This type of camber can be easily constructed and maintained. It consists of two straight slopes from the edges joining at the center of the carriageway. This type of camber is very simple and can be easily constructed and maintained. It consists of a continuous curve either elliptical or parabolic. It provides a flat road surface at the middle and steeper towards the edges. On account of steeper edges, this type of camber provides better drainage property. This camber is therefore preferred by fast moving vehicles and suggested for urban roads. This type of camber is difficult to construct and maintain. The barrel camber has more steeper edges which are inconvenient to use. Moreover, the steeper edges are errored quickly and hence additional kerbs are to be provided. 1. Camber provides quick drainage of rainwater and thus saves the foundation course of the road structure from weakening by percolation of rainwater to it through the road surface. 2. This prevents rainwater to accumulate in local shrinkages or depressions and forming water pool on the road surface, which are disagreeable to the public as well as to the road structure. Usually, camber is provided on the straight roads by raising the center of the carriageway with respect to the edges, forming a crown or highest point on the center line. At horizontal curves with superelevation, the surface drainage is effected by raising the outer edge of pavement with respect to the inner edge while providing the desired superelevation. the rate of camber or cross slope is usually designed by 1 in ‘n’ which means the transverse slope is in ratio 1 vertical to “n” horizontal. Camber is also expressed in percentage. If the camber is x %, the cross slope is x in 100.